Industrial Rotating Machine Specializes in EMERGENCY GEARBOX REPAIRS. When you have a critical service need IRM is on call to assist. You can count on Industrial Rotating Machine to have the parts and experience to support your specific emergency gearbox repair service needs. If you would prefer to have a member of our team contact you, please fill out our convenient form below. Is Your Gearbox Ready For Pick-up? What is the approximate weight of the gearbox? A service team member will be in contact with you shortly to with details and instructions. We Offer Emergency Repairs to All OEM Gearboxes from Many Manufacturers! IRM (Industrial Rotating Machine) offers complete service and repair of industrial gearboxes. Here are some common problems that operations managers face with their industrial gearboxes and are a leading reason for repairs. If you are experiencing any of these in your application it is less costly to maintain the equipment than to replace it. But if replacement is the only option, you can actually get a better-finished product with IRM than you can from the OEM and at a fraction of the cost. IRM is the Gears Behind Industry. At the heart of most industries including manufacturing, mining, oil & gas, food production, construction and more, the industrial gearbox is what drives the economy. Gearboxes are critical to providing the power that drives heavy duty industrial equipment. When the gearbox is in disrepair the operation is in jeopardy of screeching to a halt, costing millions of dollars in unnecessary downtime. By maintaining and replacing your industrial gearboxes when they are in need industry leaders operate with greater efficiency which results in higher profits. How do industrial gearboxes work, and how do you know when your industrial gearboxes are in need of repair? Some of the most common signs of the need for industrial gearbox repair include, but are not limited to, visible leaks, noticeable vibrations, loud noises coming from the gearbox, and improper lubrication. In many cases when you can physically see leaks on your industrial gearboxes this could mean that gaskets and seals are either not seated correctly or have worn out allowing the lubrication to escape. Lower levels of oil, which facilitates the reduction of friction in your gearboxes can cause major damage to the gears and lead to breakage. If you see lubricants escaping, you can be sure that dust and water are able to get into the gearbox as well. This further exacerbates the problem and may result in the need for costly repairs. If you see visible signs of leakage the damage could already be done. 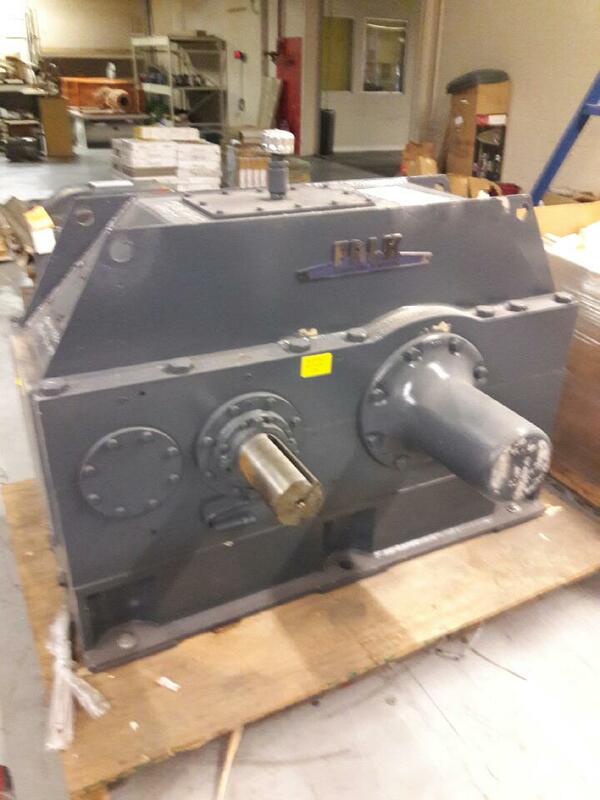 Call IRM today and let us break down your gearbox and put it through our thorough inspection process to verify what types of maintenance, repairs or replacements of your industrial gearbox parts are necessary. One of the most common issues we see from our clients who require industrial gearbox repairs are issues related to overheating. Like any other machine, proper lubrication serves to maintain long-life of your industrial equipment. When the lubrication fails so does the gearbox. The average industrial plant does not have the necessary equipment to assess and determine if or what is wrong with their gearboxes to make appropriate repairs; however, there are some visible signs that can give you an indication that something is amiss. For example, if you notice discolored or burnt paint on your gearbox, especially around the areas where bolting and seals are located, this could be an indicator that your industrial gearbox is overheating. A more obvious sign would be seeing smoke coming from the shafts themselves. Many industrial gearboxes have plastic components on them in various places. If you notice that these are melted or have become brittle, it could be an indication that gearbox is overheating and in need of repair. Another tale-tale sign is dark oil or even foam in the sight glass where you check your oil levels. If you spray your gearbox with water and it boils or steams, your gearbox is overheating and in need of repair. The problem with overheating is it causes the components to expand, and even though the components eventually contract upon cooling this can cause the metal to become brittle over time and result in breakage. This also affects the synchronization of the parts inside the industrial gearbox which, if allowed to persist, can cause a whole host of other related problems. Finally, if you notice that your gearbox is making noise or is vibrating more than usual, it is a good sign that your industrial gearbox is in need of repair. Unusual noises and/or vibrations are an indicator that the gears are no longer synchronized and with every rotation, the damage is occurring. From misalignments to broken gears and components, IRM helps get your industrial heavy gearboxes back in top shape, running smoothly and efficiently. If you notice any of these signs of wear and tear in your industrial heavy-duty gearboxes, call the professionals at IRM. We offer 24X7X365 service for emergency gearbox repairs and provide free shipping and delivery. Call us today! Upon inspection, IRM will notify you by a variable telephone conversation on the condition of bearings and gears, followed by a written work scope estimate emailed to you for approval for any necessary repair (inspections include a complete disassembly and cleaning of parts).